sXe injected is a Anti Cheat system that gives you protection against many malicious programs when you are playing your games, and It was designed exclusively to work with Half Life 1 engines: Counter Strike 1.6, Counter strike 1.5, Day of Defeat, Natural Selection, Team Fortress Clasic, Deathmatch Classic, Opposing Force, Condition Zero. Free Download sXe injected 5.8 - the latest version! sXe injected 5.7 released, the latest version, arrived at just 2 days after the former vesion (sXe injected 5.6) - it fixed an error. 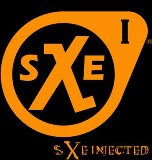 sXe injected is a Anti Cheat system that gives you protection against many malicious programs when you are playing your games, and It was designed exclusively to work with Half Life 1 engines: Counter Strike 1.6, Counter strike 1.5, Day of Defeat, Natural Selection, Team Fortress Clasic, Deathmatch Classic, Opposing Force, Condition Zero. After Kaspersky Anti-Virus Mobile arrive a new version, Kaspersky Mobile Security, that is the best solution for smartphones protection for confidential data (even the device is lost or stolen), against attacks from the Internet and malicious software programs. Kaspersky Mobile Security functions: Anti-theft protection (SMS-Block, SMS-Clean and SIM Watch), Antivirus protection, Firewall, Anti-spam for SMS/EMS/MMS, Automatic updates. System requirements: Kaspersky Mobile Security runs just on smartphones and communicators that use one of tha following operating sistems: Symbian OS 9.1, 9.2 Series 60 (Nokia smartphones only) and Windows Mobile 5.0, 6.0 . "The trial version of Kaspersky Mobile Security should be installed on the smartphone and activated using the following activation code: AAAAA-AAAAA-AAAAA-AAAA3. Transfer the distribution package of the program from the PC to your smartphone via a BlueTooth or infrared connection. Launch the installation of Kaspersky Mobile Security from your Inbox folder and then follow the installation instructions on the screen. For smartphones based on SymbianOS: If you have the Nokia PC Suite installed on your PC, right-click the distribution package file, select Install with Nokia Application Installer from the menu, and then follow the installation instructions on the screen. For smartphones and communicators based on Windows Mobile: Connect your device to your PC via Microsoft ActiveSync and copy the distribution package of the program to a folder on your device. Use the device’s built-in file manager to launch the installation of KasperskyMobile Security. Using a memory card. Copy the distribution package of the program to a memory card. Insert the memory card into your smartphone and launch the installation of Kaspersky Mobile Security using the built-in file manager. The activation procedure involves installing a license key that will verify the license and determine its expiration date. You will automatically be prompted to activate your product upon successful installation of the program. Please note! To activate the program your smartphone must be connected to the Internet! The activation code is not case-sensitive; however, it should be entered using Latin characters. Use the up/down buttons or the stylus (if available) to move between fields. Then, select the "Activate menu" item. If your smartphone is based on the Symbian operating system, a dialog window showing GPRS connection access points will open. Choose the appropriate GPRS Internet access point. After download and successful installation of the key (which will be performed automatically), the program will open the component status window." Kaspersky Anti-Virus 2009 is the latest version of that popular antivirus program, It provides the basic tools needed to protect your PC, is the backbone of your PC’s security system, and offering protection from a range of IT threats. - Intel Pentium 800 MHz 32 bit (x86) / 64 bit (x64) or higher (or equivalent), 512 MB available RAM ) for Microsoft Windows Vista Home Basic (32/64 Bit), Microsoft Windows Vista Home Premium (32/64 Bit), Microsoft Windows Vista Business (32/64 Bit), Microsoft Windows Vista Enterprise (32/64 Bit), Microsoft Windows Vista Ultimate (32/64 Bit). 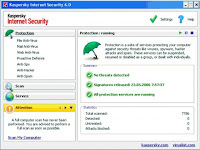 Download Kaspersky Anti-Virus 2009 (click! for download) - the latest version. Kaspersky Anti-Virus 7.0.1.325 is the latest vesion of one of the most popular antivirus software program from the World, It offers a high protection for PCs and networks and has a strong brand in the fight with dangerouse software. Kaspersky Antivirus gives you three protection technologies against threats: Hourly automated database updates, Preliminary behavior analysis, and On-going behavior analysis. Also Kaspersky Antivirus includes these features: "Protection from viruses, Trojans and worms, Protection from spyware and adware, Real-time scanning for email, Internet traffic and files, Protection from viruses when using ICQ and other IM clients, Protection from all types of keyloggers, Detection of all types of rootkits, Automatic database updates, Rollback of unwanted changes on your computer, Self-defense of the antivirus program from being disabled or stopped, Tools for creating a Rescue Disk, Free technical support (for full version users)" - publisher description. It supports the following Operating Systems: Microsoft Windows 2000 Professional (Service Pack 4 or higher), Microsoft Windows XP Home Edition (Service Pack 2 or Higher), Microsoft Windows XP Professional (Service Pack 2 or higher), Microsoft Windows XP Professional x64 Edition, Microsoft Windows Vista, Microsoft Windows Vista x64 and the hardware and software requirements are: 50 MB free space on the hard disk, CD-ROM (for installation), Internet connection (for activation and updates), Microsoft Internet Explorer 5.5 or higher (for updating signatures and the program), Microsoft Windows Installer 2.0. Download Kaspersky Anti-Virus 7.0.1.325 (click! for download) - the latest version. sXe injected 5.6 released, is a software program that includes more thread protection. Now you can download that latest version of this anticheat for free. Ultra MP3, the latest version is a free to try software program (but you can purchase It) designed for mobile phones to listen your favorite music. 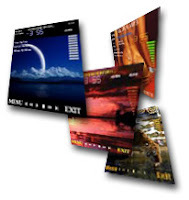 It has an interesting graphical interphace that can be canged by many skins available on the WWW, also It plays music in MP3 and OGG format, as well as MOD, XM, IT, S3M and has a built-in playlist editor. Ultra MP3 is available in the following languages: English, Czech, German, Italian, Hungarian, Spanish, Swedish, Turkish, French, Finnish, Portuguese and Dutch. The suported devices are: S60: Nokia 3230, 3620, 3650, 3660, 6260, 6290, 6600, 6620, 6630, 6670, 6680, 6681, 6682, 7610, N-gage, N70, N90, Siemens SX1, Panasonic X700, X800, UIQ: Sony Ericsson P800, P900, P910, Motorola A920, A925, A1000, BenQ P30, Series 80: Nokia 9300, 9500, Nokia 7710. Free Download Ultra MP3 1.52 (click!) - the latest version. The new version of Opera 9.50 is the fastest and most powerful Web browser available at that time. 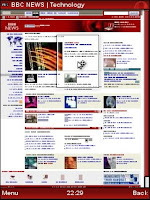 Try and experience the Opera 9.50 browser that offers you new features: Quick Find, Opera Link, Speed Dial, Mouse Gestures, Download Manager with BitTorrent, New browser engine, Tabs and Sessions, Zoom and Fit to width, Content blocking, Built-in e-mail and newsfeeds, Customize your browser, Quick and customizable Web search, Add a Widget to your life, Stay safe with new Fraud Protection and EV, Web developers: Meet Opera Dragonfly. Free Download Opera 9.50 the latest version. Mozilla Firefox 3.0, the latest version, has beend under development for the past 34 months, it's based on Gecko 1.9 Web rendering platform, include more than 15,000 improvements that resulting in a more easier to use, secure, faster, and smarter than ever before. The latest version of Ad-Aware 2008 (7.1.0.8) Free, is a software program designet to ensure high protectionfor your PC against spyware and adware. It's main features are Improved Threat Detection, Spyware, Adware, Trojans and Hijackers, Fraud Tools and Rogue Applications, Password Stealers and Keyloggers, Enhanced Rootkit removal system, Extensive Detection Database, Faster Updates and Faster Scans, Advanced Code Sequence Identification (CSI) Technology, Less Resource Usage for optimal computer performance, Enhanced Rootkit Removal System, Easy to Download, TrackSweep, Easy to Download, Install and Use, Lavasoft ThreatWork submission tool, Faster Updates, System Restore Point, Free Updates, Free Support and Compatible with Windows Vista (32- and 64-bit). The minimum requirements are: P600 or a better Processor, minimum 100 MB RAM plus OS, 100 MB free hard disk space, Operating Systems: Windows Vista (32- and 64-bit), Windows XP (Home and Pro), Windows Server 2003, Windows 2000 Pro, and the compatible web browsers are Internet Explorer (version 5.5 or higher), Firefox (version 1.5 or higher), Opera (version 9 or higher). Free Download Ad-Aware 2008 7.1.0.8 the latest version. Now you can download the latest Kaspersky Anti-Virus Update (6 June 2008) and update you antivirus. Kaspersky is one of the strongest antiviruses from the world. Founded in 1997, Kaspersky Lab is an international information security software vendor. Kaspersky Lab is headquartered in Moscow, Russia and has regional offices in the UK, France, Germany, the Netherlands, Poland, Japan, China, Korea, Romania and the United States. Further expanding the company's reach is its large partner network comprising over 500 companies globally. Free Download the latest Kaspersky Anti-Virus Update (6 June 2008) and update your antivirus. Opera Mini™ 4.1 is a the fastest web browser designed for mobile devices used in communications: mobile phones, smartphones, PDAs and other devices. I'm using this browser for 9 years, and I'm very impressed by the amount of data traffic that is saved: over 90%. So, via this mobile web browser you'll use only 10% of traffic that most popular mobile web browsers are using normally. For many people, who are using limited mobile traffic data plans, this browser is gold mine, because they can use the equivalent of up to 900% more traffic than a standard mobile browser can use in the limit of, let's say, 0.5GB, 1GB or 2GB of mobile data traffic. The massive save of 90% of amount of data traffic is possible via advanced compression algorithms, that are stored and are running on proxy servers. Yes, in case you didn't know, your real IP will be hidden by a proxy server (I would say it's a benefit, while others would concern about their privacy, but... what with so many many surveilance governmental programs running in the world, how could we hope to navigate in total privacy on the internet?). It's the most popular free web browser that is compatible with almost all smartphones and tablets, no matter what mobile operating system you're using. That software can convert AMR files (.amr) to wave files (.wav) and vice-versa useing an intuitive and user-friendly interface based on Sony Ericosson AMR Converter. Free Download Mobile AMR converter 1.4.1 - the latest version. Total Video Converter 2.40 is a powerful software that can be described such as a complete solution for video and audio conversion. It gives you the possibility to convert all formats: avi, dat, 3gp, qt, mov, mpg, mpeg, m1v, wmv, asf, ogm, mkv, dsm, vob, mp4, ra, rm, ram, amr, 3gp, 3gp2, 3g2, 3gpp, psp, flv, fli, flc, rmvb, rpm, gif, ifo, mp3, ac3, wav, aac, aiff, au, cda, mp2. Free Download Total Video Converter 2.40 - the latest version. A new version of WinRAR is prepared to be launch: WinRAR 3.80 that is now a days in Beta version for testing to find bugs and add more new features. Download for free and try the latest version of Winrar 3.80 in Beta 1. WinRar is a powerful and user-friendly archiver that can compress files better than many similar softwares. It's main features is strong compression, self-extracting, procesing of non- RAR archives, archiver manager. Free Download WinRAR 3.71 - the latest version. The latest version of Mobile 3GP converter is using "3GPtoRawAVI" converter, is a powerful software aimed to convert 3GP files (3rd Generation Partnership Project, *.3gp) to uncompressed AVI files (*.avi) very easy and with an intuitive interface. Free Download Mobile 3GP converter 1.0.0 - the latest version. The latest version of Vista Transformation Pack (8.0.1) helps your Operating System to look and run similar Windows Vista OS. Now you can enjoy of new features, used by Windows Vista without buying that Operating System. Free Download Vista Transformation Pack 8.0.1 - the latest version. With the latest version of DVD Shrink (3.2.0.15) free software you can create backup DVDs. It's an aplication that need to be used in conjunction with others DVD burning softwares (such as Nero) to burn your disks. Free download DVD Shrink 3.2.0.15 - the latest version. Free Download Mozilla Firefox 3 Beta - the latest version. The latest version of Mozilla Firefox is arriving with new major features: More Personal (Star button, Tags, Location bar & auto-complete, Smart Bookmarks Folder, Places Organizer, Web-based protocol handlers, Download & Install Add-ons, Easy to use Download Actions), Improved Performance (Reliability, Speed, Memory usage), Easier to Use (Easier password management, Simplified add-on installation, New Download Manager, Resumable downloading, Full page zoom, Podcasts and Videocasts can be associated with your media playback tools, Tab scrolling and quickmenu, Save what you were doing, Optimized Open in Tabs behavior, Location and Search bar size can now be customized with a simple resizer item, Text selection improvements, Find toolbar, Plugin management, Integration with Vista, Integration with the Mac, Integration with Linux), More Secure (One-click site info, Malware Protection, New Web Forgery Protection page, New SSL error pages, Add-ons and Plugin version check, Secure add-on updates, Anti-virus integration, Vista Parental Controls, Effective top-level domain (eTLD) service better restricts cookies and other restricted content to a single domain, Better protection against cross-site JSON data leaks), and Improved Platform for Developers (New graphics and font handling, Color management, Offline support and more). 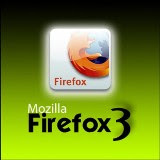 Free Download Mozilla Firefox 3 Beta - the latest version. sXe injected was designed to work with Half Life 1 engines (Counter strike 1.5, Counter Strike 1.6, Day of Defeat, Natural Selection, Team Fortress Classic, etc). It blocks cheats like wallhack, speedhack, alias, hooks, etc. Also, It's a program created for game players bringing in the new version solve problems such as: Fix: sXe Injected crash, Add: No more "kill thread", Add: First beta of self-check code. Now the Counter Strike gamers can play secure and without beeing disturbing. Attention: To be able to play in a server with sXe Injected, the client should install and execute it before the Counter-Strike. 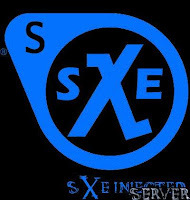 Sxe injected is compatible with Windows 2000, Windows XP and Windows Vista but it's not compatible with the Cheating-Death, VAC and VAC2 or operating systems of 64bits.Free Download sXe Injected 5.5(click) - the latest version. Among other options Windows Live Messenger 12.0.1471.1025 bring: Windows Live Alerts, Your two-way, super-powered address book, Text message their phones, Sharing Folders, Even better video conversations, PC-to-PC Calling, Talk to more of your friends, including those on Yahoo!, Works with Windows Live OneCare Family Safety. Free Download Windows Live Messenger 12.0.1471.1025 - the latest version. Windows Live Messenger (MSN Messenger) has reached version 8.5.1302.1018. This software no longer needs presentation or other description, and is very well known to most users of the Internet. 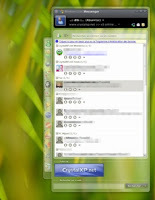 Free Download Windows Live Messenger (MSN Messenger) 8.5.1302.1018.